Is a food truck a building? Or is it something that enlivens the street? A rather straightforward proposal to enliven the pedestrian experience brought members of the Business Improvement District No. 2 Architectural Review Board into a near-existential crisis. The board has been “charged by the City to preserve the Third Ward’s heritage, history, and its collection of period architecture, all while encouraging innovative mixed-use development” according to the neighborhood’s design guidelines. 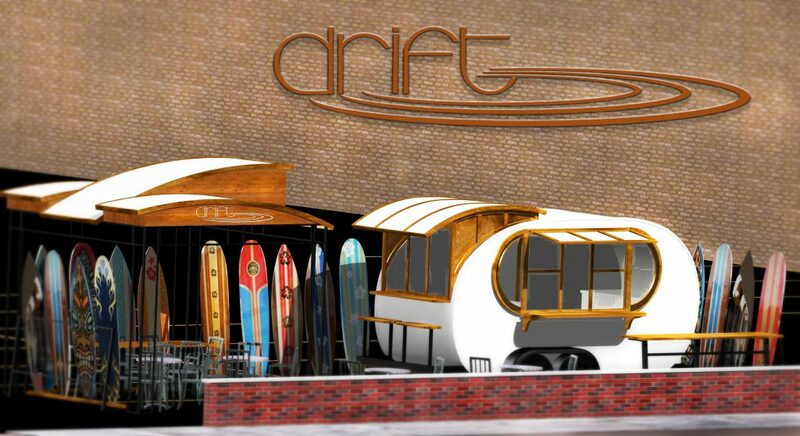 Rachel Hawken, the applicant with the proposal in question, leases four parking spaces on a surface lot from Robert Joseph at 330 N. Broadway, which she intends to use as a location for Drift MKE, her New Zealand-themed food truck that has been wandering the streets since last summer. It will be parked for the season to the south of Benelux, located behind a parapet wall dividing the surface parking lot from the sidewalk. The vehicle is white and wood, and full of curves. The area will be fenced in the rear and sides by a wall of surfboards. 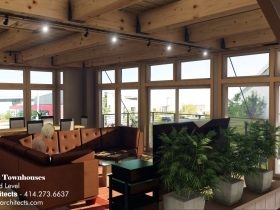 A 12-ft. by 12 ft. canopy will cover four round tables and one rectangular table. So, what’s to review? The architectural review guidelines were drawn back in the days when restaurants were located in buildings with concrete foundations, not in trailers on rubber wheels. This posed a conundrum to Ald. Robert Bauman, the Architecture Review Board’s chair. “Are we approving its existence? Or its design?” asked Bauman. He was concerned that there might be a lot of applicants to deal with if the board has to review every food truck and non-permanent structure in the area, and suggested the guidelines of the board be reviewed to clarify the matter. If the board in fact is approving the existence, “we might be setting up a precedent,” for example, allowing trucks to “camp out for six months” in a given space, Bauman noted. “It is consistent with the spirit of the guidelines,” says Matt Jarosz, the board’s coordinator. “The truck would activate the sidewalk and be a reasonable neighbor,” he added. The board unanimously approved the application. “Does that mean I can get to work on my site?” the applicant asked. The answer was in the affirmative. Non-usable door at 234 N. Broadway. Photo by Michael Horne. The third time was the charm for the 610-628 E. Summerfest Pl. 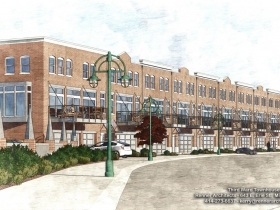 Third Ward Townhouses, proposed by architect/developer Peter Renner. The board had twice heard and rejected Renner’s proposed detailing of the parapets on the 12-unit project. This time Jeff Natrop, Renner’s co-lead partner at Renner Architects, LLC made the presentation. The new parapets alternate between pointed and curved elements similar to the pediments above the windows of the White House, which otherwise bears little resemblance to the proposed building. Natrop was pleased with the ruling, and said his most recent headache has been with the utilities that converge on his property. “I’ve had more trouble from AT&T than from you,” he told the board. 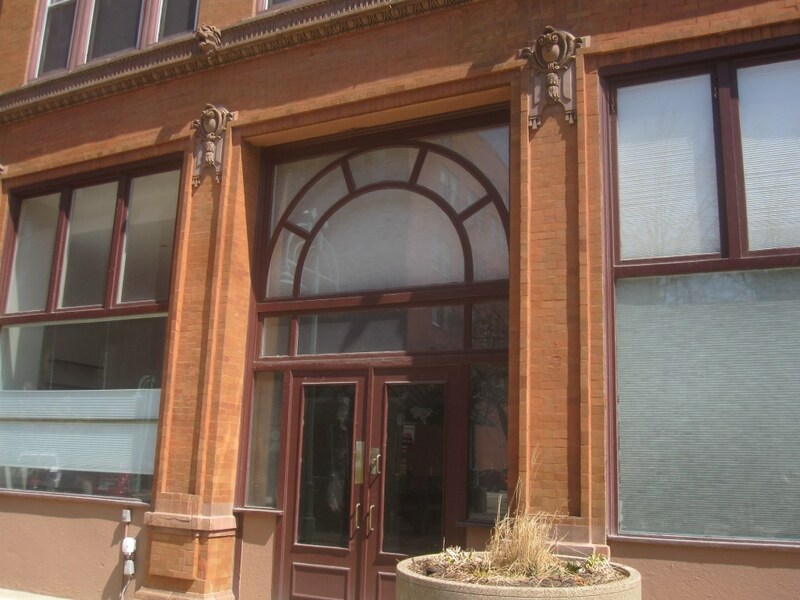 … Robin Thompson also appeared before the board to request minor first floor storefront modifications for a residential unit on the first floor of the Broadway Condominiums, 234 N. Broadway. It might come as some surprise that the door to this unit is not a functioning one but fronts a wall in the interior. In case you were wondering. 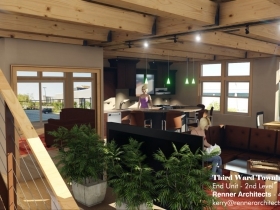 Four bays of the Mary Miss-designed Historic Third Ward Riverwalk would be removed and the walk would be extended eight feet over the river to accommodate a floating dock to serve the Black Swan venue, a riverfront event space located in the basement of the Renaissance Building, 309 N. Water St. 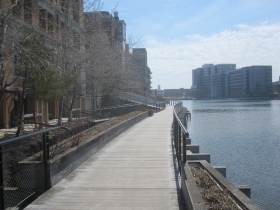 According to plans by Engberg Anderson Architects, the “Floating Dock & Landing Extension” would be accessed at the end of a ramp that connects the Renaissance Building to the riverwalk, which is freestanding at that location. 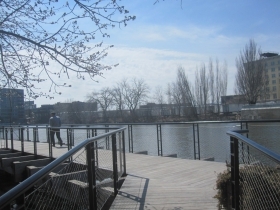 It would not connect to an existing floating dock located just feet downstream, and accessed from the former Water Buffalo restaurant deck. Though the BID District #2 is the owner of the riverwalk, this item of business was for informational purposes, and the board did not vote on the proposal. However, since the Milwaukee River is a navigable waterway, any construction will likely need the approval of the Army Corps of Engineers, and possibly other entities. It was suggested that the applicant, Jessica Frizzell, representing the owner, Physicians Realty Trust, begin by contacting the Corps. The extension of the walk through the removed four bays would put a deck over a distinctive feature of the walk, namely a portion of the exposed supporting structure upon which the sinuous walk rests. The rhythm of the supporting ribs is a key design element of the Mary Miss project, so there will be some visual impact on it. Business, by the way, is booming at the Black Swan, which is booked until 2020. The owners are looking for a second location. 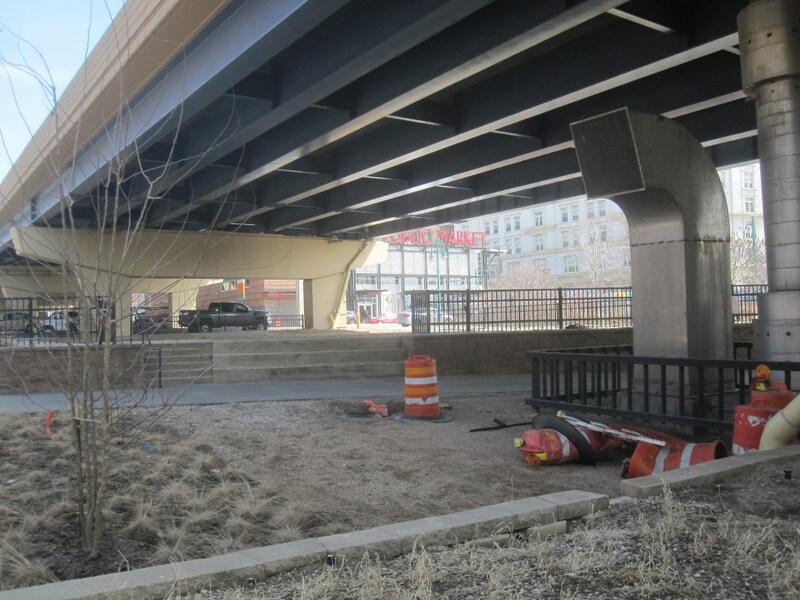 A couple of years ago the State of Wisconsin rebuilt the elevated freeway that runs over the Third Ward, occupying much of the block between E. Clybourn St. and St. Paul Ave. east of the river. 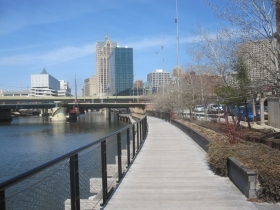 The portion between the Milwaukee River and N. Water St. was landscaped to state highway standards, which are considerably below those of the historic district. Plans were that the BID would lease the space beneath the freeway from the Department of Transportation and put together a plan to make the area usable and more attractive than it currently is. The Historic Third Ward is planning to improve this space under the freeway. Photo by Michael Horne. As a result, he says he will be meeting with two firms — one from Wisconsin and one national (and otherwise unidentified) — to develop a plan for what is now a dead zone. Plaisted says there have been a number of park conversions beneath freeways lately. “Google under freeway parks,” he said. Some are quite fine, and others are horrible, he noted. The designers might like to take a trip beneath the Holton Viaduct, where the simple installation of some swings has energized a once-dead area beneath a bridge. The DOT also left unenviable conditions in other areas beneath the freeway, which serves, lamentably, as the entrance to the Historic Third Ward, as signs on the overpasses tell us. Also worth considering is a possible and needed expansion of the Milwaukee Public Market, which could occupy part of the space beneath the freeway. The freeway’s construction rendered the market’s loading dock unusable, for example, and that would provide a natural space for expansion. The Milwaukee Streetcar Operations and Maintenance Facility, which we visited last week, is likewise located under the freeway. I would love to see the Public Market expanded at this site, it would be an even bigger draw, especially if it opened up directly to the riverwalk and the plaza/greenspace!